Dubai: The long wait is over, it’s Dubai World Cup day all over again. The world’s richest race day featuring over 100 of the best racehorses, from over 12 countries. What’s at stake? A staggering $35 million in prize money and bragging rights to being the fastest, most durable and most exhilarating equine athlete in the sport. His Highness Shaikh Mohammad Bin Rashid Al Maktoum, Vice-President and Prime Minister of the UAE and Ruler of Dubai, created the Dubai World Cup in 1996 with a vision to it becoming the definitive world championship, an event that would bring the whole racing world together in Dubai. With perfect planning and execution it has continued the momentum of that landmark evening at Nad Al Sheba Racecourse, 24 years ago, to take its place at the pinnacle of the sport. People like me, who has witnessed all the Dubai World Cups, feel the value and take home a greater appreciation of what is so special about the sport. As has been the tradition in recent years, Shaikh Mohammad on Thursday personally honoured individuals who have made the difference by their performances, commitment or involvement through the Mohammad Bin Rashid Al Maktoum Horseracing Excellence Awards as well as members of the awards’ Board of Trustees. 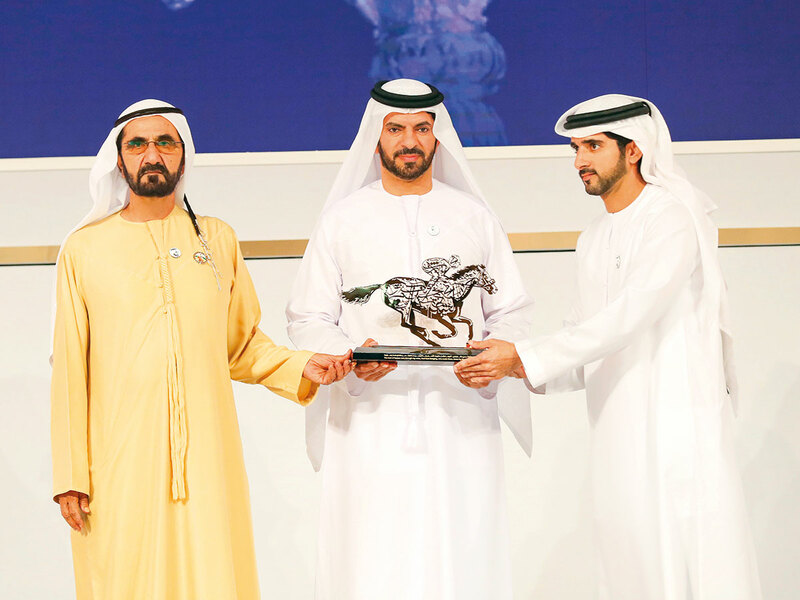 Shaikh Mohammad congratulated the winners and called on the horseracing fraternity to continue pursuing excellence and to promote the culture of breeding and riding horses as a noble sport. He also praised the initiatives and generosity of the national institutions and businesses for supporting the Dubai World Cup, which he described as an important national event that enhances the UAE’s global position. Meanwhile, it was revealed that more than 40 broadcasters are primed to bring the action from Meydan Racecourse on Saturday to TV audiences from all around the world substantiating that the Dubai World Cup fixture, sponsored by Emirates Airline, attracts huge global interest. The Mena (Middle East and North Africa) region will be served by live coverage from Dubai Racing Channel and Yas TV. In addition, the Dubai World Cup will headline Eurosport’s weekly equestrian magazine programme broadcast in more than 120 territories, while Trans World Sport, the leading global sports magazine programme, will offer the fixture added exposure, as will CNN, which is covering the race for its World Sport programme. Saturday action will start at 3.45pm with the traditional curtain raiser, the $1 million Dubai Kahayla Classic for Purebred Arabian racehorses and will culminate in the $12 million Dubai World Cup at 8:40pm. Lifetime Achievement Award: D Wayne Lukas.